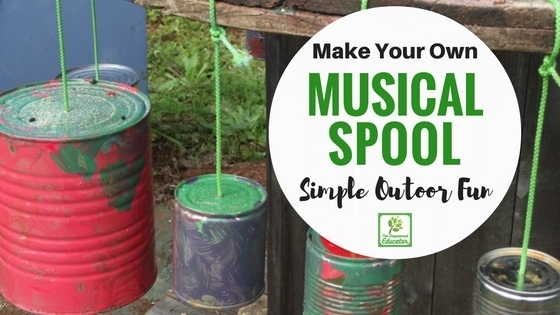 Natural Playspaces Series – Building a Musical Spool Table! I’m sharing a little project with you today that has been a while in the making but is so easy to do no matter how much space you have. Kids love to make noise and music and this little table has both those covered! All you need is some washed recycled tins (I know you have them somewhere!! 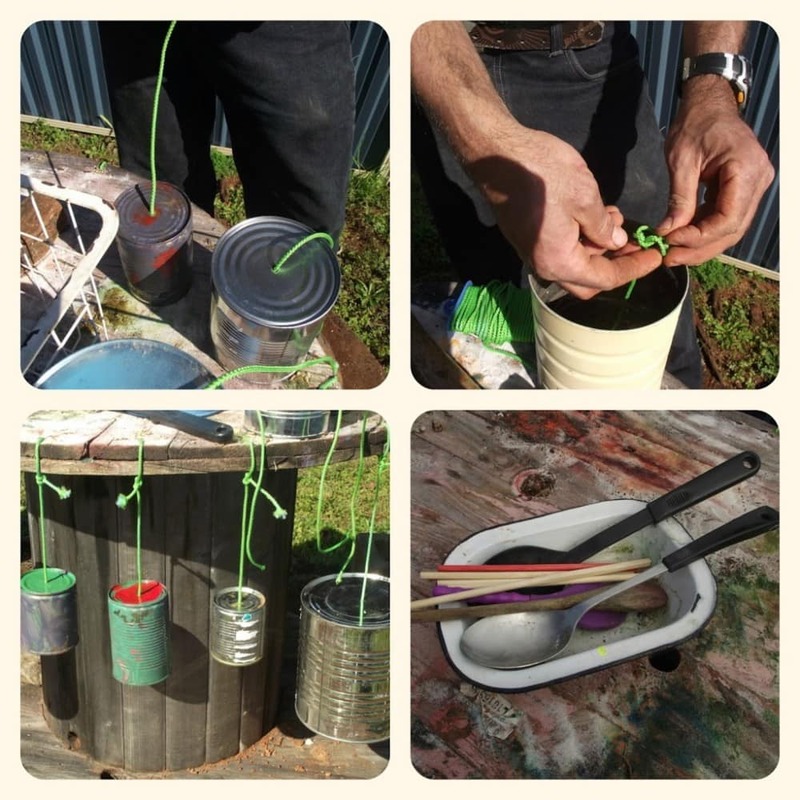 ), a little cord or twine, some paint and a recycled spool which you will often find in the industrial areas and if you ask nicely they will usually give you a few for free. 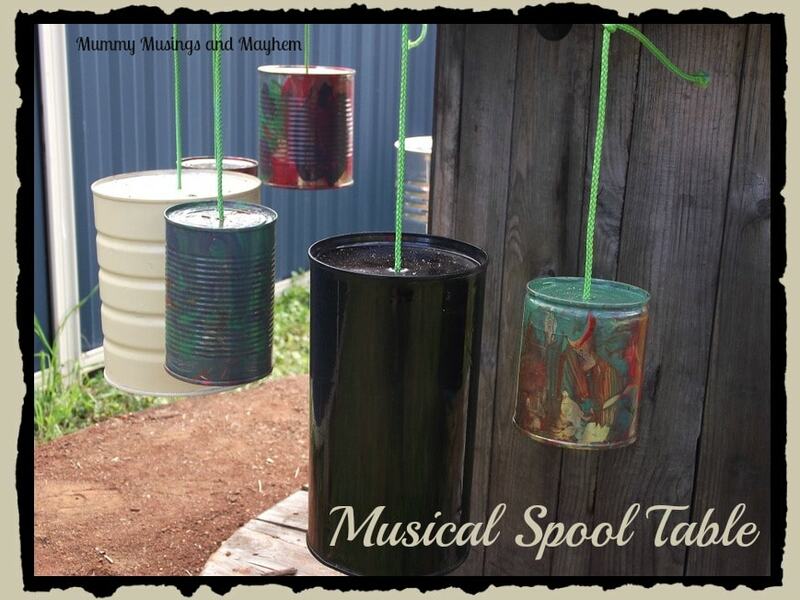 If you can’t lay your hands on one…no matter, you can hang your musical tins anywhere you fancy! After collecting and washing tins over a few weeks we were ready to paint! This is the first and probably only time you will see my girls in aprons…they wanted to try them but I really do find they are more trouble than they are worth! 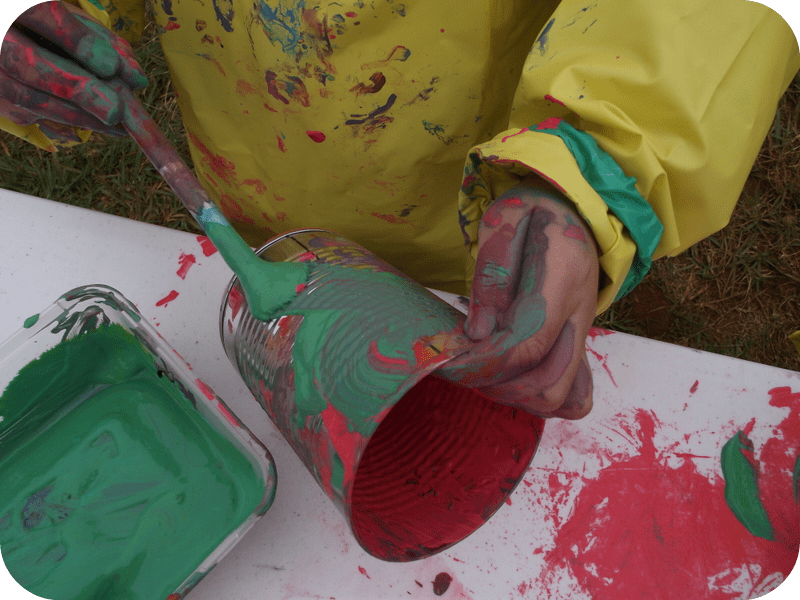 I laid out some trays with a few different colours of kid’s acrylic paint…and stood back….way back! 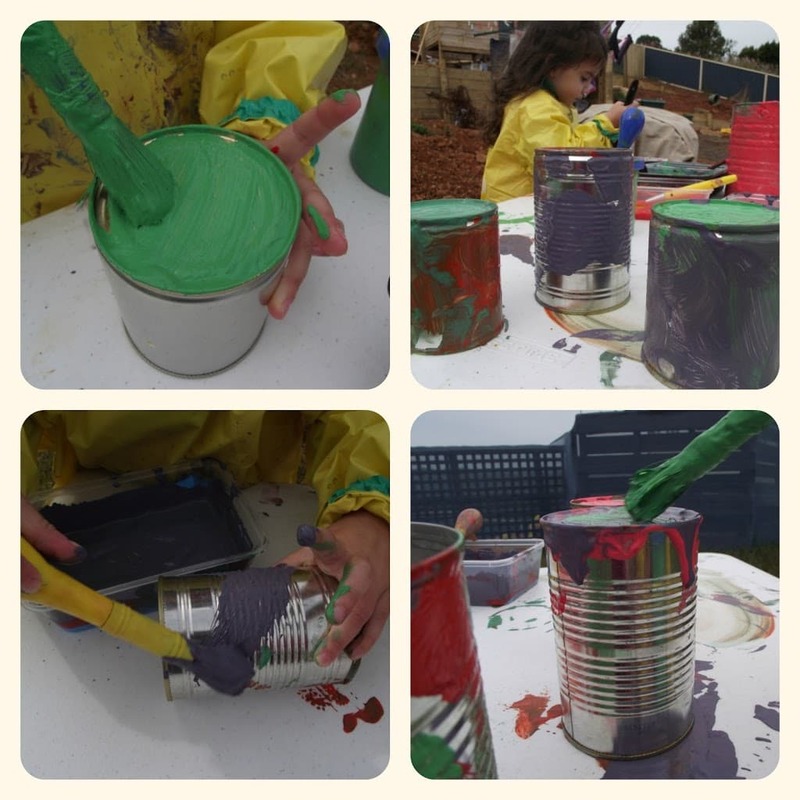 I’m not going to tell you it wasn’t a messy activity because it was…but it kept them so engrossed and they found so many different ways to paint the tins….inside, outside, on the top, on the bottom. 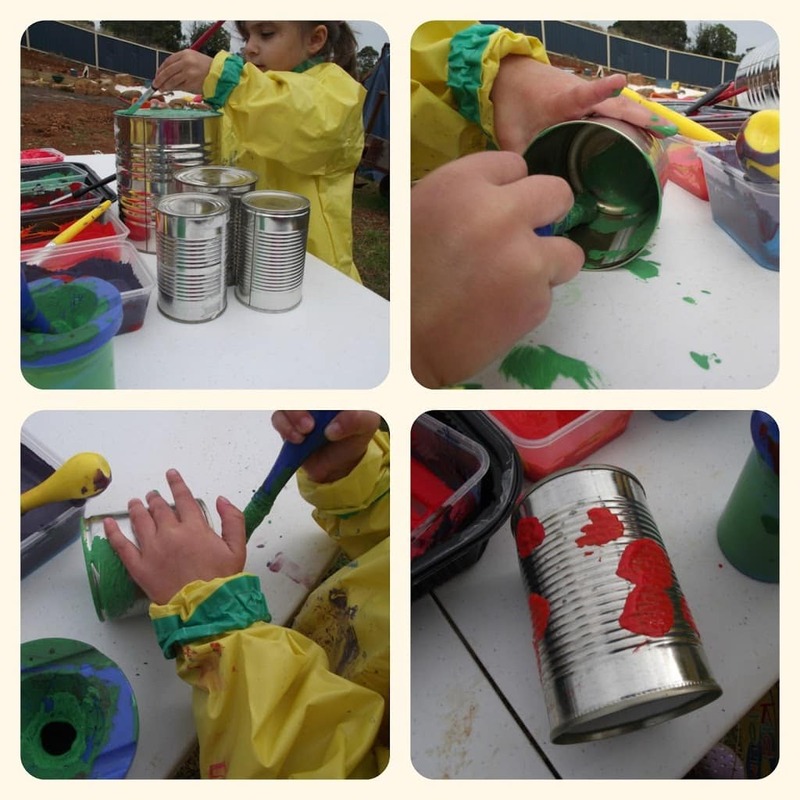 It was a great challenge for their fine motor and coordination skills as the tins often wanted to roll away. 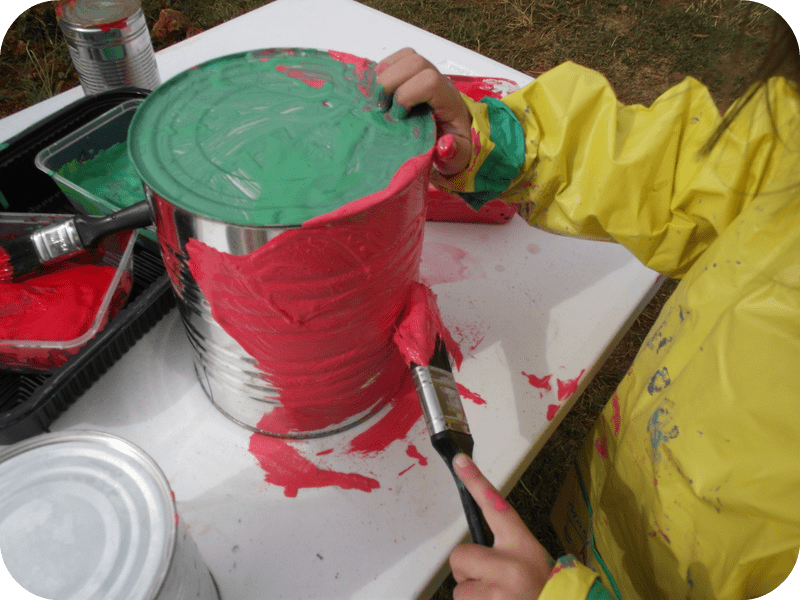 I did actually divide up the tins between both girls before painting as frankly it was just easier to avoid the squabbles…and I was having one of those tough days! I did let the girls choose a few of their own though and found it very interesting that Ruby went for the smaller tins and Tara went for the big ones…. 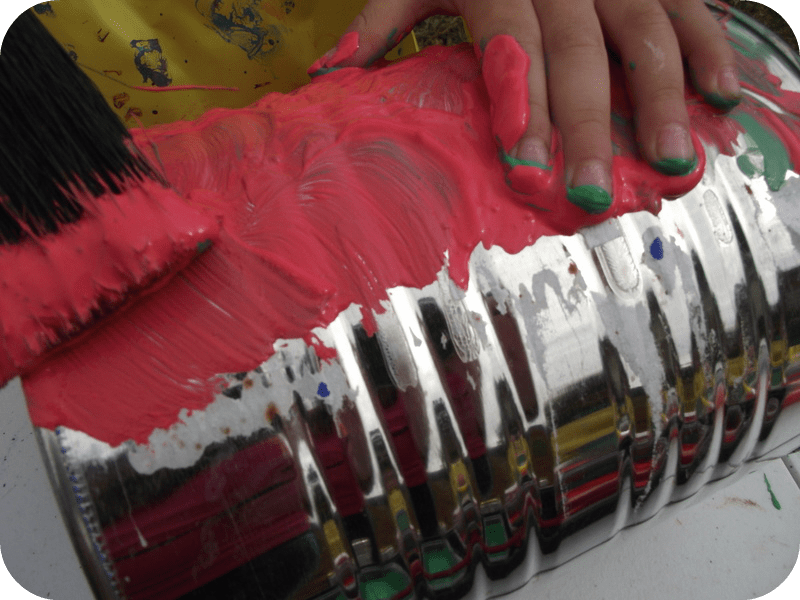 She really, really loved that big tin and spent so much time getting it just the way she wanted! No one…and I do mean no-one was allowed to touch it until she was satisfied with her work. It was a little bit of a challenge (good parent speak for really, really difficult) to get them to finish and come inside. There was so much paint on those tins I think it took over a week for them to completely dry! But the joy of cleaning magically got them passing me the paint pots…the toddler twosome do love to clean a table and wash hands! I am never without my bucket of water close by when we do these sorts of activities. When they were finally dry, His Patient Self drilled a few holes for me (yes I could have done it myself but hey, I did the messy part!) 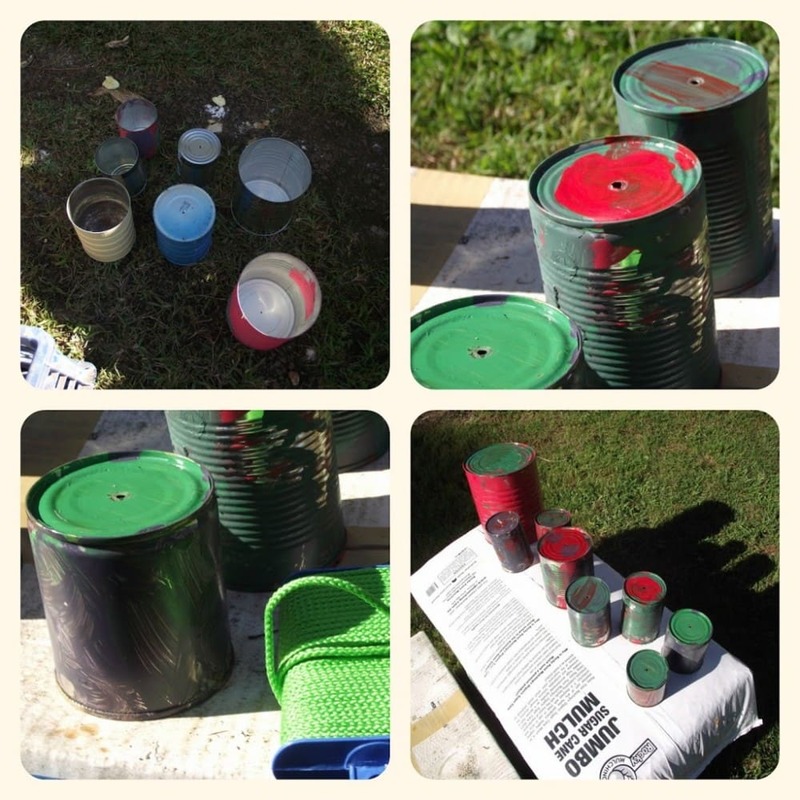 I then gave them a coat of clear lacquer to hopefully keep the paint colours on the tins for awhile while outdoors. They dried after an afternoon in the sun. And to be perfectly honest….they then sat on my shelf in a basket for quite a few weeks while we worked on other projects in the backyard. Last weekend I kept looking at the spool and instead of making a wall as I had planned I thought it would work well to use them around the spool table. We threaded some twine through the tin holes drilled earlier and then tied a knot to keep them in place…His Patient Self again got out his trusty drill and made holes all around the wooden spool edge. It was then a simple matter of threading the cord through those holes and again using a knot to secure. We placed them at different heights to help create different sounds. I added a bowl of ‘banging tools’ and the girls were ready to explore their new backyard addition! They absolutely love it…they both walk around and around banging, tapping, finding new tools (two big sticks are their current favourite) and singing. 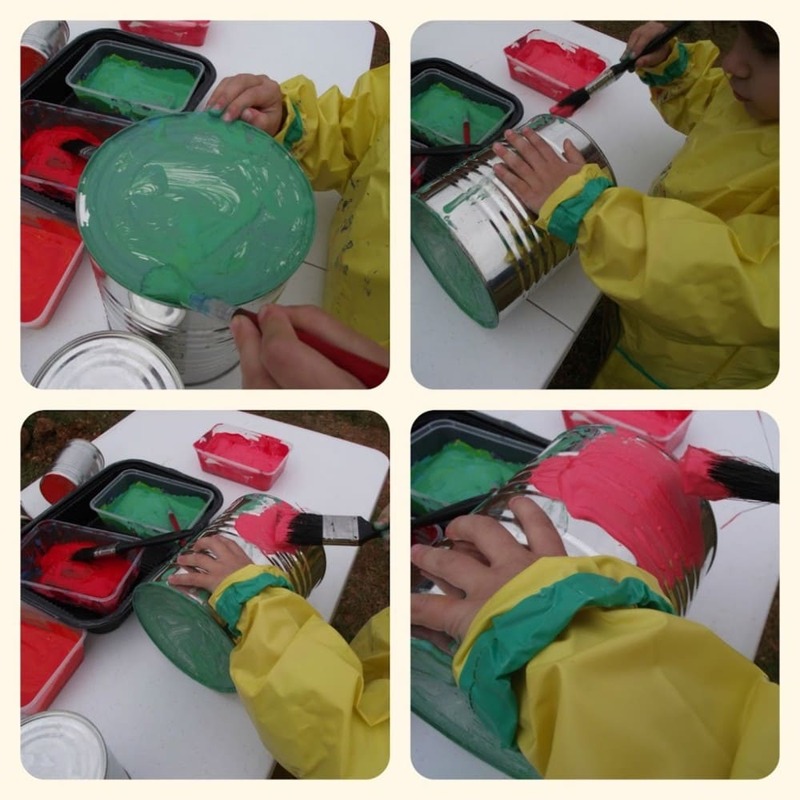 They also worked out that if they hold the big tins they can use them like drums and tap their sticks on the top. I often see them down there now trying out different styles of banging and exploring how to produce different sounds. 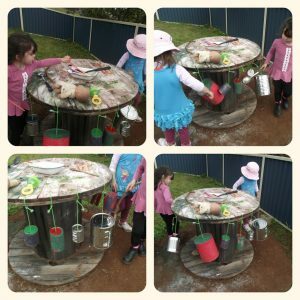 I do love when I see the girls playing with something we all had a hand in creating….not to mention something that used mainly recycled materials and cost next to nothing to make! What do you think? I’m loving the new addition to our natural playspace and I hope the family day care children will too! Where would you hang the tins if you didn’t have a spool? 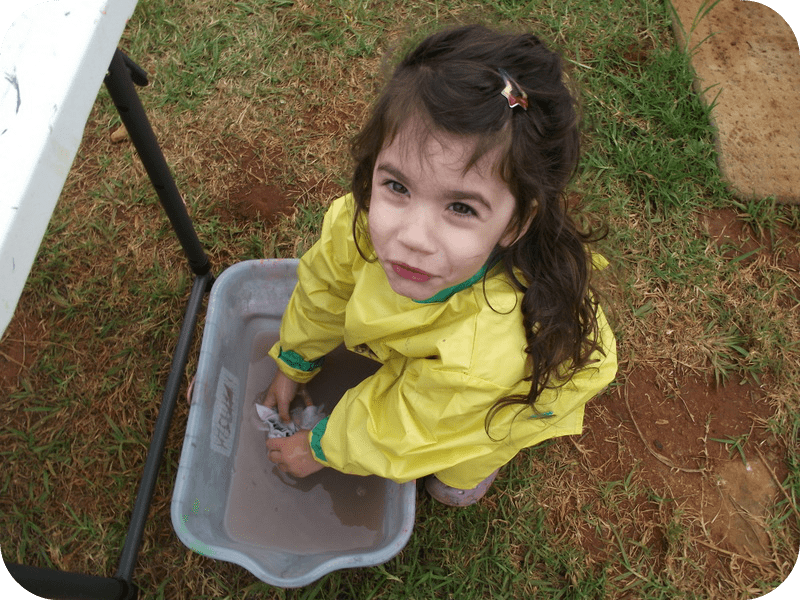 « Weekend Wanderings – Simple Outdoor Play Ideas for Sick Toddlers! What a wonderful idea. 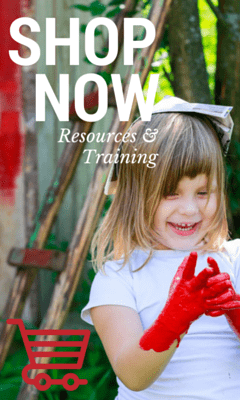 Lots of fun for toddlers! 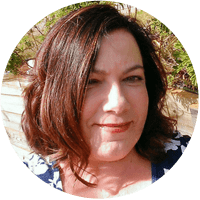 Thanks Emma…don’t mind saying it was a bit of fun for us adults too lol! Even if you don’t have the spool Karen you could just hang a few of the tins anywhere really! Fabulous Jodie! Just as fun to create as to make music with. 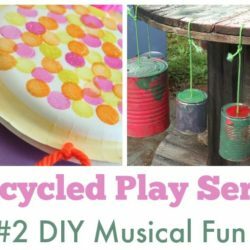 What fun for the kids and what a neat way to upcycle. 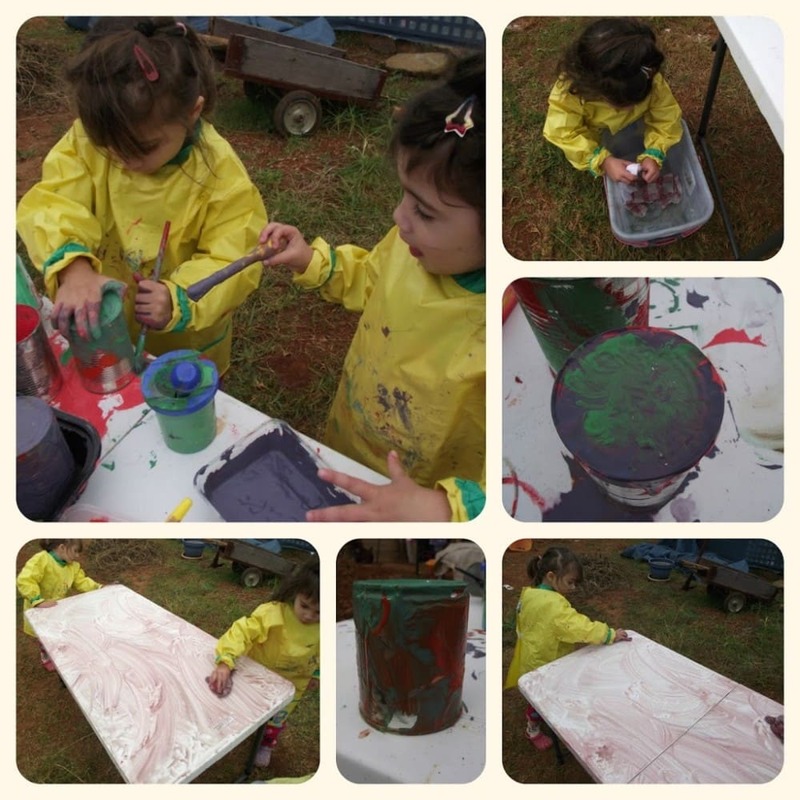 They did have so much fun creating Ann…messy but lots of fun and they were so proud of their efforts! 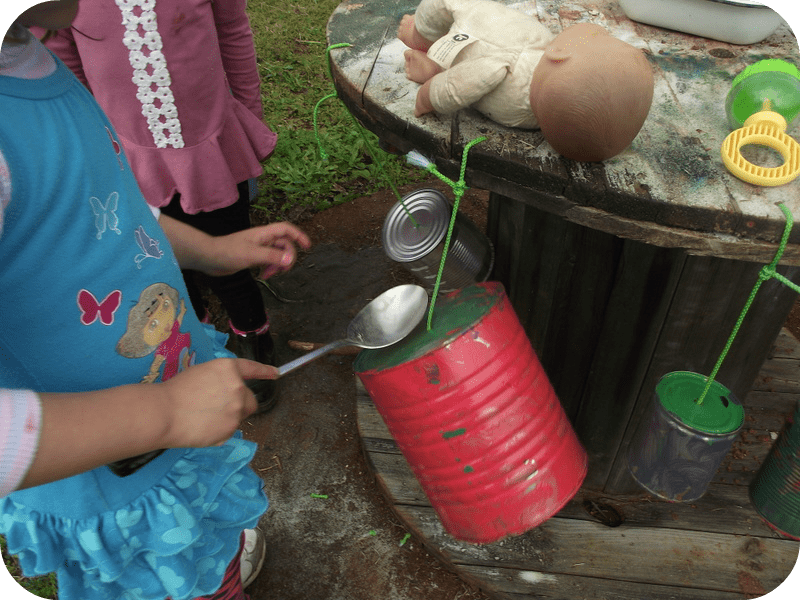 Thanks Sara…I heard them going around the spool the other day saying which tins were theirs as they hit them, so cute! Oh wow that is fantastic! I like recycling too! So many options with recycling isn’t there? And best of all they asked me if they could wash the empty cans in the kitchen the other day to paint…yay! 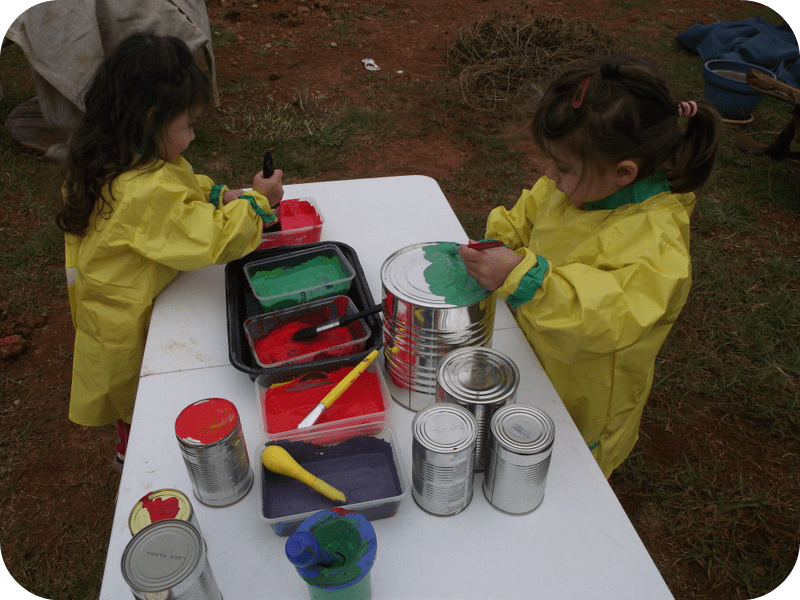 How great to get the children involved in creating an activity, and have so much messy fun while doing it, they must be very proud of their efforts! I love the way they are happy to clean up too, thanks for sharing your latest creation with Country Kids. They are so proud of their efforts and seem to enjoy wandering and looking at the cans hanging just as much as banging them!I actually think somedays they would just love to clean the table rather than make the mess! Thanks Jaime…do let me know if you do! “Never without my bucket of water”! – definitely a crafting Mama’s motto! Love it. The whole activity is perfect. They made it and now they can play with it. I hope they have lots and lots of fun with it. Hehe Cheryl…did sound a little funny didn’t it? Absolutely true though and that way i don’t need to worry about messy hands and they know they can clean them when they get uncomfortable with the feeling of messy hands! They are indeed having lots of fun with it…thanks so much for stopping by! We use a bungee stretched between the fence and a post.love the spool idea. This is great Jode! I wish I had those gorgoeous spool tables of yours, they are just wonderful and look great! 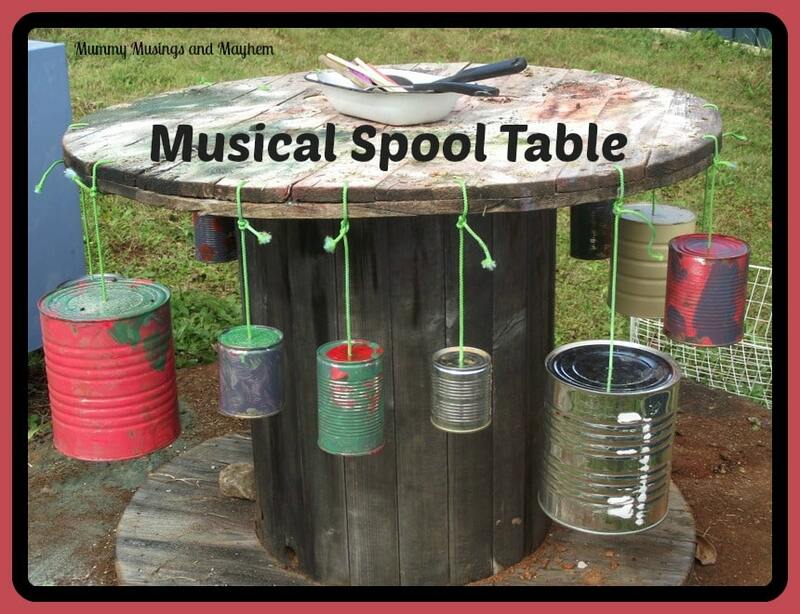 I do love a good spool table Amie!! Can use them for so many things! 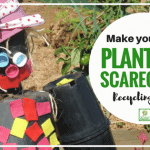 You can usually get them for free from places in the industrial estates…or go searching on weekends as a lot of places leave them out on the kerb hoping people will take them lol! So glad you like it Nichola…do let me know if you try it…am sure your girls would love it! Gosh Jode your FDC kids are just going to LOOOOOVE your place! So very fabulous. What a brilliant idea! I love that the children basically made them themselves. What a great home you have. Oh wow, I LOVE this so much. 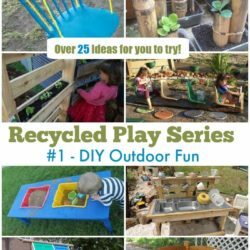 Adding this to our list of ideas for making a fun outdoor play space this Summer. I am LOVING watching your outdoor space unfolding, it gets more and more amazing every week. This idea is so easy to do but so fun, imagine all the different ways the kids can play with this set up. I want to come and play too!